Articles in our media archive are listed in alphabetical order by news outlet. Aftonbladet: “A firewall against terror in Islam’s name,” by Wolfgang Hansson. In this Swedish language article, Wolfgang Hansson describes LibForAll Advisor, Kyai Haji Mustofa Bisri, as a “firewall against terror in Islam’s name.” The problem is not Islam, says Mustofa Bisri, but religion when it is used to suppress human rights and freedoms. Read about Mustofa Bisri’s European visit. Agence France-Presse (AFP)/The Weekend Australian: “Dalai Lama Defends Islam at Anti-terror Religious Meeting,” by Gary Chapman. The world’s oldest (and 3rd largest, after AP and Reuters) news agency carried this story about an historic summit between the Dalai Lama and Muslim leaders that LibForAll helped organize. Al-Ahram: “Indonesian Islam,” by Muhammad Abul Fadl, deputy editor, Al-Ahram. “The vital role of the Nahdlatul Ulama stems from its success as a mediator between the Indonesian government and its people. The NU can maintain a harmonious relationship between the government and the people due to its spiritual values, political engagement and mass following, which combine a profound understanding of Islam with respect for the inherent variety of Indonesia’s countless local cultures. That is why the Nahdlatul Ulama has consistently nurtured the values of Islam Nusantara (East Indies Islam) for over a century, and is now poised to export its collective wisdom and experience throughout the world, for the benefit of humanity.” Al-Ahram (The Pyramids) is one of the oldest (est. 1875) and largest-circulation daily newspapers in the Arab world. Al-Ahram: synopses of 13 al-Ahram columns (January through June 2014) by Dr. Ali Mabrook, Executive Director of the International Institute of Qur’anic Studies’ public policy division, the Center for Contemporary Islam (CCI). Dr. Mabrook wrote a regular column for al-Ahram, one of the oldest and most widely-read newspapers in the Arab world. Two additional papers in this collection were written for the Mominoun (Believers) Without Borders Institute and a third for an international conference regarding the philosophical thought of Murtada Mutahhari held in Qom, Iran. Al-Ahram: synopses of 21 al-Ahram columns (March through December 2013) by Dr. Ali Mabrook, Executive Director of the International Institute of Qur’anic Studies’ public policy division, the Center for Contemporary Islam. Al-Ahram: “The Classical Roots of Abu-Zayd’s Thought,” by Dr. Ali Mabrook. “The essence of Abu-Zayd’s work was to establish a kind of interactive relationship between the text (i.e., the Qur’an) and human understanding, in which the text is not positioned as an authority that subjugates or enslaves the human mind. In other words, Nasr sought to establish an arena of interactive communication between human understanding and the texts in question. American Islamic Leadership Coalition: “A Communiqué in Response to the National Strategy for Counterterrorism.” LibForAll joins fellow American Islamic Leadership Coalition members in proposing key revisions to U.S. National Strategy on Counterterrorism. Bild: “Islam is Linked to Terrorism.” “It is an alarm call – from an authoritative source: ‘There is a clear relationship between fundamentalism, terror and the basic assumptions of Islamic orthodoxy.’ That is what the Islamic scholar Yahya C. Staquf said in a recent interview with Frankfurter Allgemeine Zeitung (FAZ). Staquf is not just anyone. In fact, he’s General Secretary of the world’s largest Muslim organization, the Indonesia-based Nahdlatul Ulama (40 million followers). CNN: Indonesian Muslims Denounce Islamist Extremism. This video features remarks by LibForAll Foundation associate, Bayt-ar-Rahmah Director of Religious Affairs and General Secretary to the Nahdlatul Ulama (NU) Supreme Council, KH. Yahya Cholil Staquf; and LibForAll Foundation advisor and Research Director of the Centre for Asymmetric Threat Studies (CATS) at the Swedish Defence University, Dr. Magnus Ranstorp, at the 2016 International Summit of Moderate Islamic Leaders gathering in Jakarta. Denver Post: “Muslim Rocker: Bonds Trump Bombs,” by Bruce Finley. The former fundamentalist tells a U.S. defense forum that military force alone won’t change hearts or deter terrorists. Detik.com: Ahmad Dhani’s visit to the U.S. on behalf of LibForAll Foundation generates widespread media coverage in Indonesia, including dozens of print and television reports, such as this article which appeared in Indonesia’s largest news portal, detik.com. Gatra: “NU, Muhammadiyah and Pancasila,” by Ahmad Syaafi Maarif. 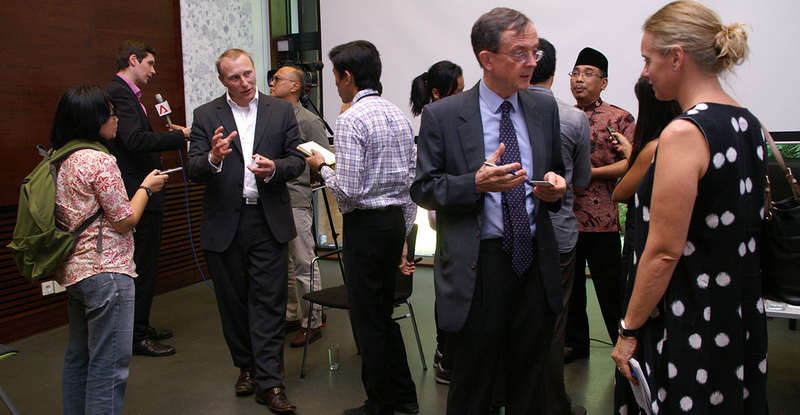 LibForAll Advisor, Ahmad Syaafi Maarif, writes about his visit with LibForAll co-founders Holland Taylor and former Indonesian president, Abdurrahman Wahid. Hidayatullah: “It’s the West that Benefits Most from Stigmatizing Wahhabism.” “Since the explosion of the bombs in Kuningan [Jakarta] in July of 2009, the terms Wahhabism and transnationalism have suddenly been on everyone’s lips. Many national television stations and other mass media outlets have been quoting a number of leading national figures about the relationship between terrorist bombs and Wahhabism. Inter Press Service News Agency: “Mystical Islam Deters Fundamentalism,” by Alexandra di Stefano Pironti. International Qur’anic Studies Association: “On the Qur’an and Authority, “ by Dr. Ali Mabrook, Deputy Director of Academics at LibForAll’s International Institute of Qur’anic Studies (IIQS), and head of its public policy division, the Center for Contemporary Islam (CCI). In this article, Dr. Mabrook describes how the Qur’an was transformed from a text open to the full range of human inquiry and participation into an instrument of political authority. This politicization of the Qur’an closed the text to free examination and made its interpretation both fixed and absolute. Mabrook argues that the first step in “re-opening” the Qur’an is de-politicizing it. Jakarta Globe: “The Enemy Within: Islamic Extremists And Their Dreams of a New Caliphate.” “Truth that is not organized can be defeated by evil that is. So goes an old Sufi saying.” This article highlights LibForAll’s organized strategy, backed by LibForAll Advisors President Abdurrahman Wahid, Ahmad Syafii Maarif and Mustofa Bisri, to counter the spread of Islamic extremists. This makes President Wahid’s grave one of the ten most visited pilgrimage sites in the world. Two of the many popular tributes to President Wahid, which emerged spontaneously in the years following his death in 2009: Gus Dur: Champion of the People and Gitu Saja: Koq Repot (That’s Just How It Is: No Problem). Newsweek: “The Jihad Against the Jihadis,” by Fareed Zakaria, cites the CATS study and, without naming LibForAll, refers to its decisive role in helping to counter radicalization: “Perhaps the most successful country to combat jihadism has been the world’s most populous Muslim nation, Indonesia. In 2002 that country seemed destined for a long and painful struggle with the forces of radical Islam. The nation was rocked by terror attacks, and a local Qaeda affiliate, Jemaah Islamiah, appeared to be gaining strength. But eight years later, JI has been marginalized and main-stream political parties have gained ground, all while a young democracy has flowered after the collapse of the Suharto dictatorship. New York Times: “Islamic Group Gains Power in Indonesia,” by Peter Gelling, explores the growing prominence of a group called the Council of Ulemas—whose leaders have increasingly espoused a radical form of Islam—who has worked to establish itself as an assertive political force. Advocates of religious tolerance worry that the council’s new clout could signal the start of religious radicalization in a country known for its moderate brand of Islam. Public Broadcasting Service (PBS) airs “Struggle for the Soul of Islam: Indonesia” as part of its “America at a Crossroads” series. LibForAll CEO Holland Taylor served as an advisor on the film, which features LibForAll activist Ahmad Dhani and LibForAll associate Yenny Wahid. Sicherheit Heute (Security Today): Interview with one of the world’s leading Qur’anic scholars, LibForAll Foundation Advisor Dr. Nasr Hamid Abu-Zayd, on the integration of Muslims into European society, and the modernization of Islamic thought. This German online magazine is read widely by counter-terrorism and homeland security experts. Strategic Review: “Theology matters: The case of jihadi Islam,” by Rüdiger Lohlker. Since 2014, LibForAll Foundation has worked closely with Dr. Rüdiger Lohlker, one of the world’s leading experts regarding the online/offline activities of al-Qaeda, ISIS and other terror groups. A senior professor of Islamic Studies at the University of Vienna and respected counter-terrorism advisor to the European Union and various Western nations, Dr. Lohlker heads the Vienna Observatory for Applied Research on Terrorism and Extremism (VORTEX), whose founding partners include the University of Vienna, Nahdlatul Ulama, GP Ansor, LibForAll/IIQS and Bayt ar-Rahmah. Dr. Lohlker’s landmark article refutes the widely held and frequently asserted view that Western governments, scholars and media outlets should neither critically examine, nor address, the religious dimensions of Islamist terrorism. Swedish National Defence College: “Islam and terrorism” seminar. The largest lecture theatre at the Swedish National Defence College was nearly filled to capacity when LibForAll senior advisor, Kyai Haji Mustofa Bisri, addressed the audience on the topic of “Islam and terrorism.” You can watch a video of the seminar here. TIME Magazine: “Why Indonesia Matters,” highlights the importance of the country with the world’s largest Muslim population and democracy, and the immediate need for more vigorous mobilization by moderates to counter the rising tide of radical ideology. Features quotes from LibForAll co-founder and board member, H.E. Kyai Haji Abdurrahman Wahid, LibForAll Advisor, Azyumardi Azra, and Yenny Wahid, Executive Director of the Wahid Institute. The Turbulent World of Middle East Soccer: “Did they or didn’t they? The battle for control of Brussels’ Grand Mosque,” by James Dorsey. “There is a clear relationship between fundamentalism, terrorism, and the basic assumptions of Islamic orthodoxy. So long as we lack consensus regarding this matter, we cannot gain victory over fundamentalist violence within Islam,” said Yahya Cholil Staquf, the 51-year old general secretary of the Nahdlatul Ulama (NU). Voice of America: “LibForAll Foundation Promotes Tolerance in Indonesia, Other Muslim Nations.” Mike O’Sullivan reports that former Indonesian president Abdurrahman Wahid and Southeast Asian pop star Ahmad Dhani have joined forces in an organization called LibForAll, which promotes religious tolerance. LibForAll foundation, co-founded by American Holland Taylor, is building a network of moderate Muslims to counteract extremism. Wall Street Journal: “Unfriendly Fanatics,” LibForAll CEO Holland Taylor reviews journalist Sadanand Dhume’s book, My Friend the Fanatic. Wall Street Journal: “The Obstacles to Israeli-Palestinian Peace,” by Kyai Haji Abdurrahman Wahid and Abdul A’la, describes how non-Arab Muslim leaders can help to remove the poison of hatred that has long frustrated attempts to reach a political settlement of the Israeli-Palestinian conflict. Wall Street Journal: “Hungry for Asian Islam,” by Joseph Braude, tells how Southeast Asian Muslims can promote a pluralistic and tolerant understanding of Islam in the Middle East, and recommends strong support for such efforts. Wall Street Journal: “Daughter of Islam,” by Nancy de Wolf Smith. “An eloquent (and elegant) foe of Muslim extremists.” The Wall Street Journal’s weekend interview profiles LibForAll associate Yenni Wahid, daughter of Kyai Haji Abdurrahman Wahid and head of the Wahid Institute in Jakarta, Indonesia. Wall Street Journal: “The Stakes in Bali,” by LibForAll CEO C. Holland Taylor. Islamist radicals hate and fear the variant of Islam predominant in Indonesia. Washington Post: “Rock Star Rattles Radical Islam,” by Rebecca Cho. LibForAll activist Ahmad Dhani woos youths with songs of peace and romance. Dhani, 34, says attacking the ideology that motivates terrorists is the key to suppressing radical Islam. Washington Post: “Extremism Isn’t Islamic Law,” by Kyai Haji Abdurrahman Wahid. Muslim leader and former Indonesian President Wahid explains in detail why rigid application of traditional interpretations of Shari‘a law, such as demands for the death penalty for those who change their religion, is in contradiction to Islamic principles. Using Islamic sources, he argues for a “pluralistic and tolerant understanding of Islam” and calls on Muslims worldwide to “bring our limited, human understanding of Islamic law into harmony with its divine spirit—in order to reflect God’s mercy and compassion, and to bring the blessings of peace, justice and tolerance to a suffering world.” An important article from one of the shining lights of the Muslim world. Washington Post: “In Indonesia, Songs Against Terrorism,” by Kyai Haji Abdurrahman Wahid and C. Holland Taylor. The cult of death has incited fanatics to violate Islam’s most sacred teachings in the name of God. Songs by the rock band Dewa urge listeners to join the army of love, not jihad.